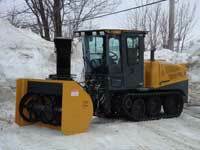 DEMO IN-STOCK & READY FOR IMMEDIATE DELIVERY! CALL US TODAY TO SET UP A DEMO & SEE THE CAMELEON IN ACTION. 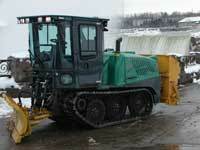 The Cameleon® is a multifunctional vehicle designed and manufactured by R.P.M. Tech. This revolutionary and unique vehicle can transform from a track vehicle to an articulated four wheel drive vehicle as needed. 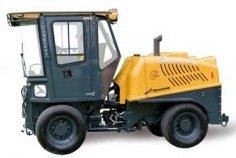 Equipped with a Perkins engine of 97 kW (130 hp), the Cameleon supplies more hydraulic power and is the most powerful compact vehicle on the market. Its certified ROPS and FOPS aluminum cabin, mounted on air ride suspension and shock absorbers, is safe and comfortable. Tracks to Wheels in less than 4 hours! Mounted on pneumatic suspension, mobile, light, anti-corrosive, designed to offer increased visibility in the front and rear decreasing blind spots. Certified ROPS and FOPS. Includes joystick, dashboard indicators, tilt and telescopic steering wheel, CD player and AM/FM radio. 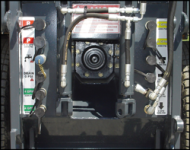 The Cameleon® offers 20% more hydraulic power than its closest competitor. With its Perkins engine, the Cameleon® can travel from 24 km/h in work mode and up to 40 km/h in travel mode. The Cameleon offers unrivaled power. 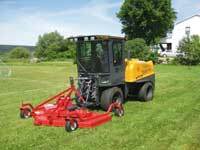 The Cameleon® chassis is articulated by a roller bearing system allowing easy adjustment and minimal maintenance. Our engineering has developed a unique chassis enabling rapid switching of the vehicle traction mode. 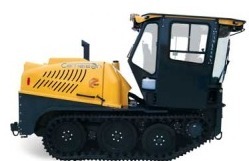 The Camelon® converts from a track vehicle to an articulated four wheel drive vehicle in less than four hours.